Erkunden Sie Balis spirituelle Seite mit dieser privaten Tour durch lokale Tempel. 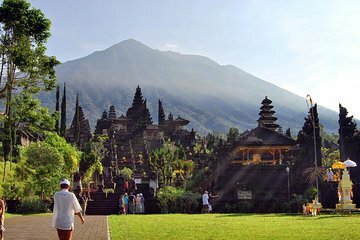 Sie und Ihr Guide werden solche Wandertouren wie den Elephant Cave Tempel, den architektonisch herrlichen Batuan Templea und den Tirta Empul Holy Spring Temple, der für seine zahlreichen Teiche, Bäder und Pools bekannt ist, besuchen. Sie werden auch den Besakih Mutter Tempel auf dem Berg Agung besuchen, bevor Sie auf einer Kaffeeplantage anhalten, um Balis berühmten Luwak Kaffee zu probieren. A very informative and interesting day, touring some of the more interesting temples in and around ubud. All the different temples are fascinating, each different in their own ways. Many opportunities to purchase local art and crafts including fabrics, paintings and jewellery. Lunch was in a restaurant, one of several, situated on a mountaintop road, all of which have absolutely amazing views of mount Batur Volcano and the valleys below. A very long day, but a fantastic experience and well looked after by our lovey English speaking tour guide and excellent driver. Interesting day. We enjoyed visiting the temples and the coffee plantation, but I did not appreciate having to stop at several local craft stores.